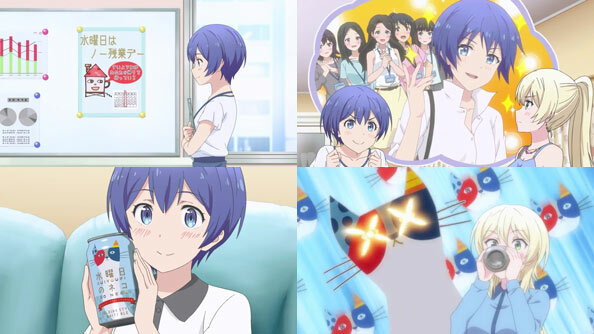 When Michiru heeds a work poster that encourages employees to leave on time on Wednesday (which may or may be a trap depending on her co-workers reactions to her leaving), she’s discouraged to find no one home yet. She decides she’ll use the extra time on Wednesday to attend a gym and do yoga, since that’s what she believes Tokyoites do. When she gets home Kae is there, lounging like a cat with a can of Suiyoubi no Neko, a Belgian Style White Ale brewed with orange peel and coriander (like Allagash White or Blue Moon). It’s described as a great beer for hump day and also a good first beer for people who don’t like the bitterness. Kae reveals that Neko was indeed her first beer, and that prior to that she didn’t like beer’s bitter taste at all, shocking Michiru. The white ale inspired Kae to travel the world sampling various beers and the cultures that brewed them. In other words, it was a catalyst for action. Michiru ponders how she can change her life post-Neko, but she already has: after a couple of rough early sessions, she’s gotten the hang of Wednesday Yoga, and can now claim to have an active lifestyle!